On Tuesday 12th October on BA flight 77 the policies of the UK and the Europe Union claimed another life. 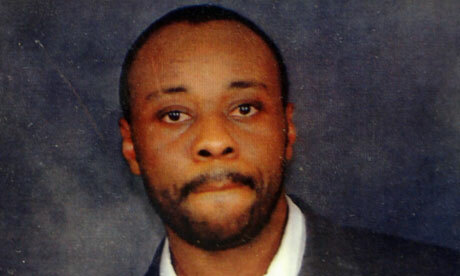 Jimmy Mubenga, an Angolan with a family in the UK, was killed on a flight from Heathrow . Whilst the Home Office initially claimed that Jimmy ‘fell ill’ and ‘passed away’ in hospital, eye-witnesses tell a very different story. Jimmy was being forcibly deported and was being accompanied by three private security personnel from Group 4 Security (G4S). Around take-off Jimmy began to complain and make some noise, probably due to the fact that he was being forcibly deported to a country that he fled from. The G4S guards then twisted his arms behind his back and pushed his head down into his lap whilst putting their weight on his back. According to eye-witnesses they exclaimed, “he will be quiet once we are in the air”. Jimmy then began to moan and cry out that he was suffocating, prompting G4S to continue putting weight onto his back. After around 40 minutes he slipped into a coma. The plane was stopped on the run-way and an ambulance called. Unfortunately Jimmy was proclaimed dead upon arrival to hospital. On Monday 18 October, the Institute for Race Relations released its report entitled ‘Driven to Dersperate Measures’ . It cites the deaths of 77 asylum seekers as being directly due to the UK’s migration laws. More than 28 were suicide cases such as Osman Rasul, an Iraqi Kurd who jumped from a high-rise tower after being left destitute and penniless after his first asylum claim was denied. Others include Abdullah Idris, a Sudanese asylum seeker who was found hung in his cell on Christmas Day 2007 and Ama Sumani a Ghanian woman who was deported from her hospital bed in Cardiff whilst receiving life-giving treatment. This act was described as an act of ‘atrocious barbarism’ by the Medical Journal ‘The Lancet’. As there is no legal way for an asylum seeker to enter the UK others have died attempting to cross into the UK. There have also been deaths at the hands of racists on the streets, deaths whilst working in the black economy and deaths after being deported back to home countries. Also included are the survivors of racial attacks, UKBA raids and those who were destitute. The report is highly disturbing and reflects a small percentage of those who have suffered for the crime of moving. These cases highlight the realities of border controls and, in particular, forced deportation. Two years ago Medical Justice compiled the report ‘Outsourcing Abuse’ It detailed cases of serious violence and abuse during deportation and catalogued hundreds of injuries sustained in the process. Broken bones and punctured lungs are among them. Medical Justice warned that a death would happen soon if the whole system was not reviewed and radically changed. The No Borders network has regularly reported on the abuse received by people at the hands of the Asylum system, including the assault on Suren Khachatryan and the treatment of Genevieve Adetoro . One thing that certainly does need looking at is the use of private companies to enforce border policy. The Danish company Group 4 Security runs several detention centres in the UK and on the day that its staff were suffocating Jimmy, it was lobbying for greater involvement in custodial security in UK Police stations. They have a history of abusive and racist behaviour towards people being deported and No Borders amongst others have campaigned against them for years. No Borders South Wales stands against all deportations and the detention estate in general. We continue to fight for freedom of movement for all. We encourage anyone who finds this article a drive to do something to get involved. There will be a benefit show on Thurs. Dec. 2nd at Sigma nightclub in Swansea, “Jamming for Justice for Jimmy Mubenga and Ian Tomlinson”, 9 pm – 3 am, £3 or more if you can afford it – all proceeds to be split 50/50 between Swansea Asylum Justice and the Ian Tomlinson Family Campaign.